A soldier wounded in the Civil War, Inman turns his back on the carnage of the battlefield and begins the treacherous journey home to Cold Mountain, and to Ada, the woman he loved before the war began. As Inman attempts to make his way across the mountains, through the devastated landscape of a soon-to-be-defeated South, Ada struggles to make a living from the land her once-wealthy father left when he died. Neither knows if the other is still alive. In 1997, Charles Frazier’s debut novel Cold Mountain made publishing history when it sailed to the top of The New York Times best-seller list for sixty-one weeks, won numerous literary awards, including the National Book Award, and went on to sell over three million copies. It was the inspiration for the Oscar-winning film directed by Anthony Minghella and starring Nicole Kidman, Jude Law, and Renee Zellweger. Charles Frazier lives in North Carolina, where this novel is set, and where he and his wife have been developing a horse farm for the last five years. He has taught in universities, written travel books and had one short story published. 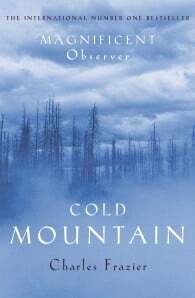 Cold Mountain, his first novel, is based on stories of his ancestors' experiences during the Civil War, handed down through the generations.